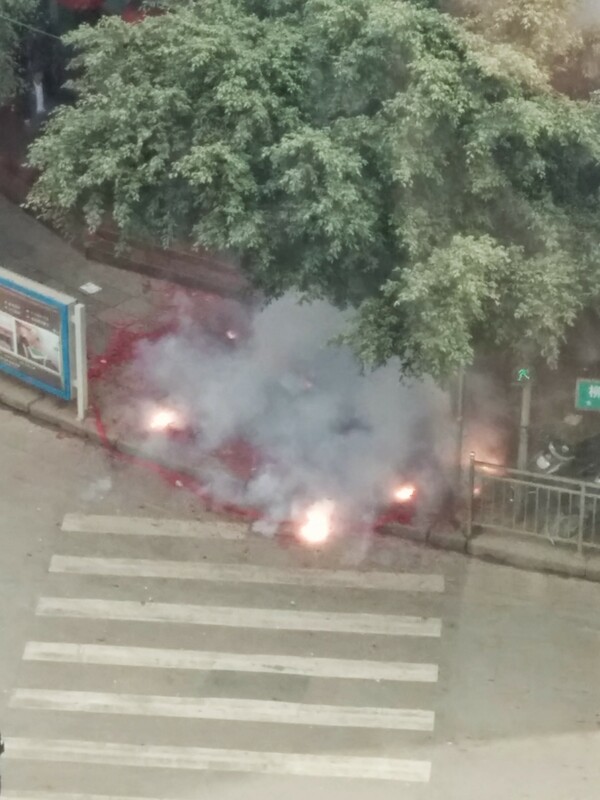 It’s T minus 33 days to the biggest holiday in China, and I’m just now starting to see signs of the season. 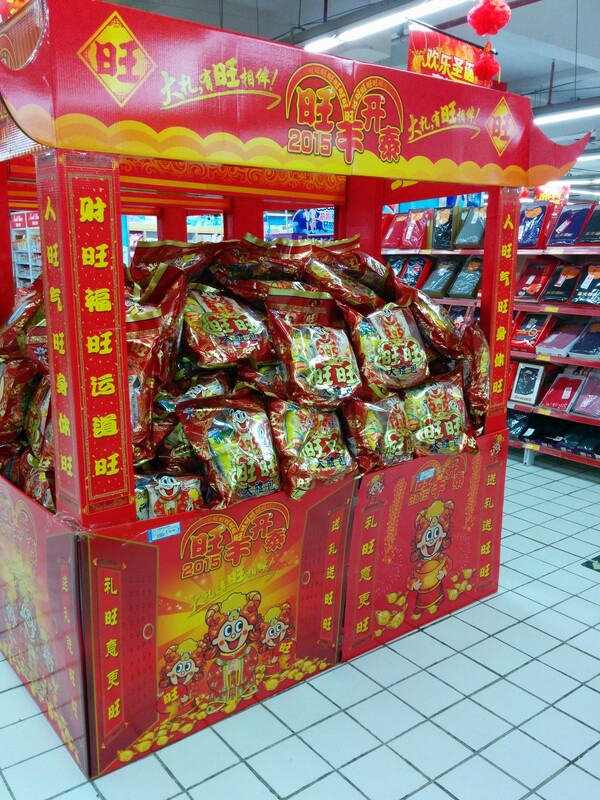 Stores are starting to put out special gift packs of all the things you’re going to want to bring to your family for Chinese New Year*: chocolate, nian gao in the shape of fish, Wang Wang snacks, knock-off Wang Wang snacks, all those good things. Everything is, of course, is packaged in red-red-red-RED! There’s gold, too, and a little pink thrown in for good measure. Soon there will be displays of red underwear, holiday clothes, and all kinds of door decorations for sale along with the fancy snacks. 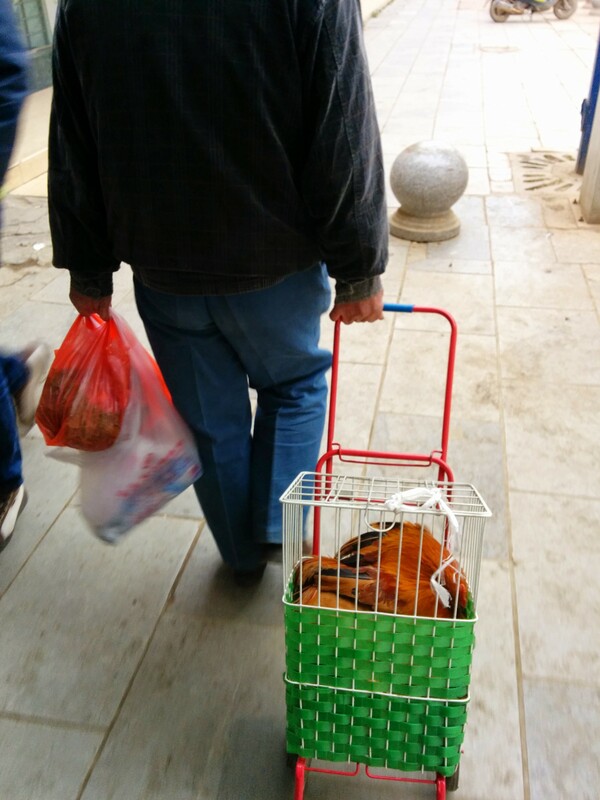 Oh, look, this man is taking his pet chicken out for a stroll. Still, it seems like I can detect a little more electricity in the air. A little more energy, a little more hustle and bustle. I noticed it as we passed through the fowl area of the market. They’re about to have their busiest time of year, selling live chickens, ducks, and yes, a few geese, too. Is it my imagination, or are there more baskets and cages lines up on the sidewalk? More trucks stopping to unload? More animated discussing and bargaining, with bigger crowds of people standing around to watch? I wouldn’t be surprised if there are even customers buying some birds now to take home and fatten up before the big meal. I’m pretty excited about Chinese New Year. I know a lot of foreigners hate the noise and the craziness, and are happy to escape China each year when Spring Festival* rolls around. But I love how the entire atmosphere of the country changes for the holiday. Suddenly everyone is jolly and smiling, happy to have time off and to be with family. Hot and noisy and right in the middle of the sidewalk. This will actually only be our second Chun Jie* in China. For most of the past decade, we’ve either been in Thailand or the States this time of year. I’m quite happy to have another chance to be in the middle of all the renao. I love the traditions – pasting chunlian on doors, joining the crowds to buy all the traditional food, wearing red, blaring obnoxious New Year’s songs, getting hongbao ready for the kids in our lives. 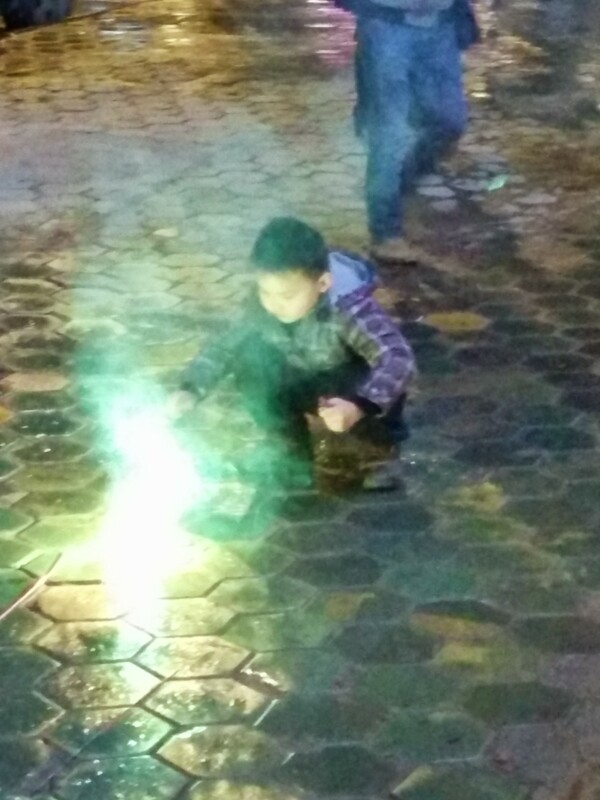 Ah, the joy of a kid and his own arsenal of fireworks, a lighter, and no adult supervision. And, I LOVE buying fireworks. I think my husband thinks this is ridiculous, but it takes me back to my childhood in the Midwest, where all manner of pyrotechnics were legal, and my dad would take us to the glorious fireworks tents to load up on smoke bombs, bottle rockets, Roman candles, ground displays and more. And now? We live in a place much more magical than the Midwest: we live in the birthplace of fireworks, and you’d better believe they’ve got some good stuff here. That’s awesome enough, but what makes it even better is that this year, we’ll be celebrating in small town China. Cities have regulations on where you where you can set off fireworks and how long you can fire them off at night. In a small town, though? Anything goes. So, good food, happy neighbors, fun traditions, lighting things on fire. Yup, there’s a lot to look forward to. Unless, of course, you’re a goose. *Chinese New Year, Spring Festival, and Chun Jie are different names for the same holiday. Lunar New Year is one more name, though that gets used more in an international context.